After figuring that I have leftover tomato sauce, cheese, sausage and olives in the fridge, I thought: PIZZA! But then I realized I didn't have any yeast. So, since the idea of having pizza for dinner was stuck in my head I decided to research some no-yeast pizza recipes online. It seems like there are thousands of those, so I decided to give my own spin on it and I've gotta say it turned out amazingly delicious. - Place all ingredients in a bowl. Mix until the mixture becomes doughy. - Put the dough on a generously floured surface and start kneading. If the dough is too sticky, sprinkle some more flour and keep kneading until it's no longer sticky. - Wrap it in cling film and let it rest for 30min. This will make it more manageable. - Preheat oven to 200 C degrees. - Roll the dough to a desired pizza size, transfer it into an oiled baking dish and brush it with olive oil. Bake it for 5min. 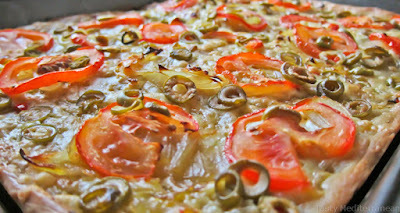 - Put your toppings on, then bake it for additional 15min or until golden brown. Enjoy! * You can use plain flour also, but make sure you add 1tsp baking powder so the dough rises.